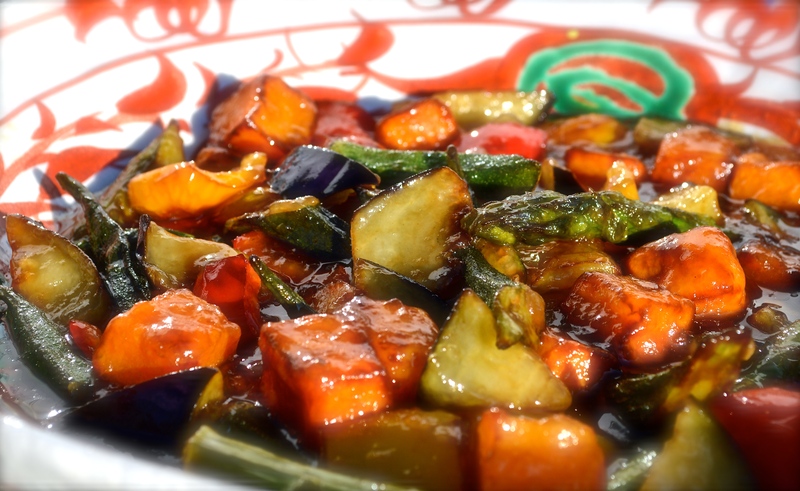 ‘Agedashi yasai’ are fried vegetables served with a delicious soy and dashi based sauce. The veggie combo is perfect with a steaming bowl of rice and some tofu or grilled white fish. You can either serve this up straight away and eat it hot or you can make it in advance and eat it cold. A colourful recipe for a colourful day! 1. Cut veg into large chunks. 2. Make sauce and simmer on a low heat. 3. Heat plenty of oil in a deep pan. 4. Put cornstarch and veg in large mixing bowl and mix with your hands to coat the veg. 5. Place a sieve over a bowl next to the oil so that you can transfer the veg from the oil to the sieve as soon as it is cooked. 6. Check oil is hot and deep fry veg in batches and place in the sieve to drain excess oil. 7. Put the veg in the simmering sauce. Bring the sauce with the veg back up to boil and then switch off straight away. 8. Put into serving dish. Eat hot or cold, either is delicious. If eating cold, put it in the fridge and take out just before you want to eat it.